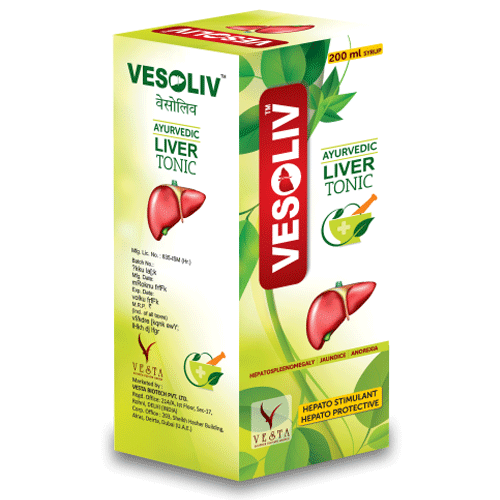 Vesoliv syrup is a herbal Hepato-protective and a Hepato-stimulant syrup that you can prescribe effectively in Prevention and treatment of VIRAL HEPATITIS,Alcoholic liver disease,Pre-cirrhotic conditions and early cirrhosisANOREXIA, loss of appetite (including, during pregnancy), Liver damage due to radiation therapy, JAUNDICE, Liver disorders including fatty acid (associated with protein-energy malnutrition). 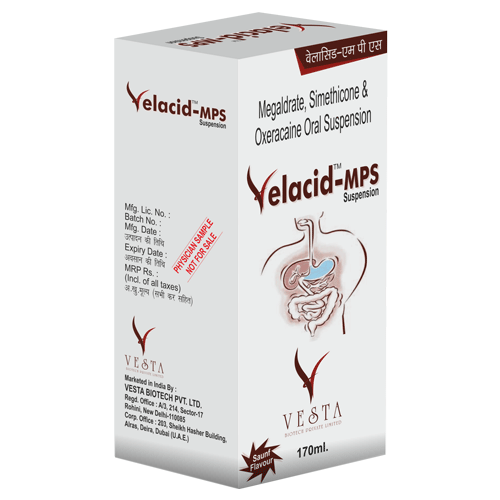 Vesoliv syrup is also used as an effective adjuvant in prolonged illness and convalescence, Hemodialysis, Hepatotoxic drugs (like anti-tubercular drugs, statins, chemotherapeutic agents and antiretrovirals). 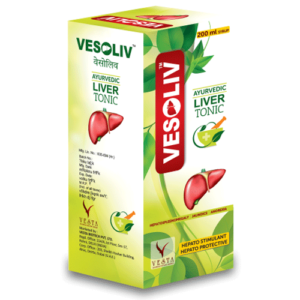 Kindly prescribe Vesolivsyrup, an ayurvedic liver tonic that offers very useful ingredients that detoxifies blood, builds immunity, rejuvenates liver cells and protects liver. 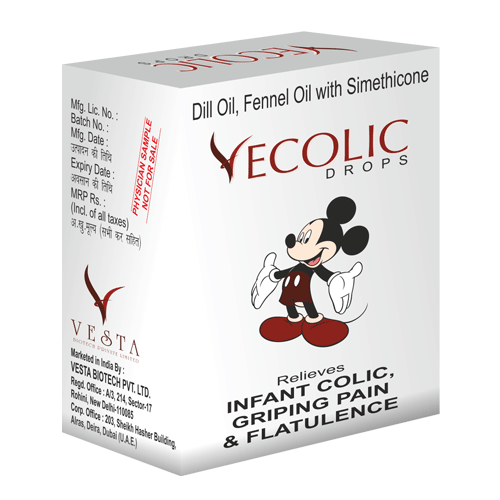 Vecolic is a combination medication of an anti-foaming agent, an ant flatulent and a carminative agent. 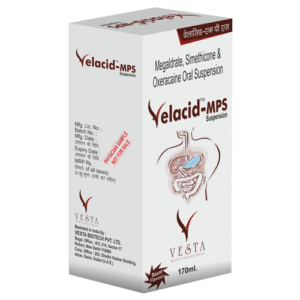 It is mainly used for infantile colic, flatulent dyspepsia and regurgitation. 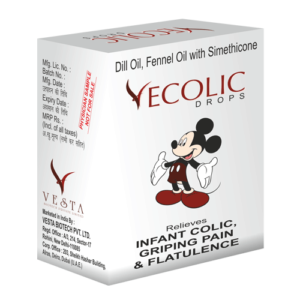 Simethicone is an oral anti foaming agent used to reduce bloating, discomfort or pain caused by excessive gas in the stomach or intestines. It is a mixture of polydimethylsiloxane and silica gel. According to National Institutes of Health reports there are no side effects with the intake of Simethecone. Dill oil is an essential oil having soothing properties. 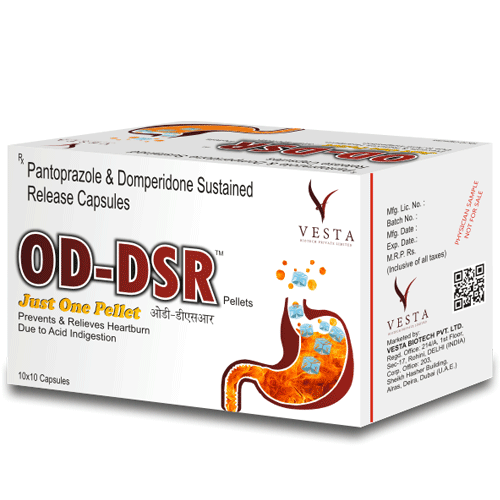 It relieves flatulence and provides relief from upset stomach. Fennel acts as a carminative agent. It promotes the passage of food through intestines and stops the muscle spasm. • Simethicone, Dill oil, Fennel Oil. Antacids neutralize the acid in the stomach and thus provide symptomatic relief form pain. Antacids are a class of drugs used to treat conditions caused by the acid that is produced by the stomach. The stomach naturally secretes an acid called hydrochloric acid that helps to break down proteins. This acid causes the contents of the stomach to be acidic in nature, with a pH level of 2 or 3 when acid secretion is active. Antacids reduce acidity by neutralizing (counteracting) acid, reducing the acidity in the stomach, and reducing the amount of acid that is refluxed into the esophagus or emptied into the duodenum. Antacids also work by inhibiting the activity of pepsin. Pantoprazole block the proton pump H+/ K+ ATPase of the parietal cell. This inhibits the final step of acid secretion into the stomach lumen. The proton pump is not able to exchange H+ for K+ ions. 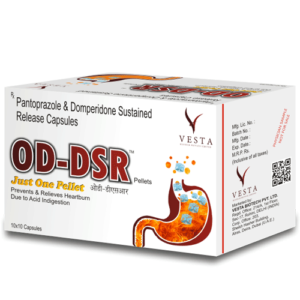 a) Complete acid control, b) Quick relief from pain, c) Faster healing of Ulcers, d) Lower relapse rates, e) Complete healing in Reflux esophagitis duodenal and gastric ulcer Domperidone is endowed with antiemetic and upper gastrointestinal prokinetic properties. 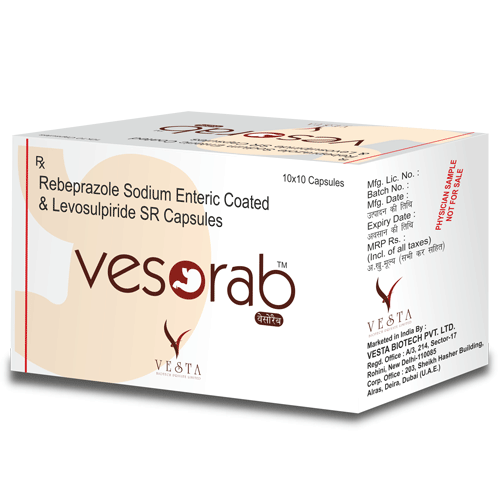 Rabeprazole belongs to a class of anti-secretory compounds (substituted benzimidazole proton-pump inhibitors) that do not exhibit anticholinergic or histamine H2-receptor antagonist properties, but suppress gastric acid secretion by inhibiting the gastric H+/K+ATPase (hydrogen-potassium adenosine triphosphatase) at the secretory surface of the gastric parietal cell. 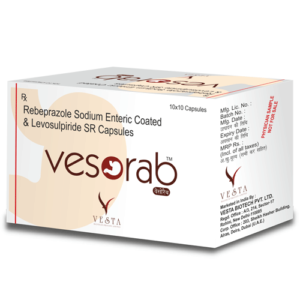 Because this enzyme is regarded as the acid pump within the parietal cell, rabeprazole has been characterized as a gastric proton-pump inhibitor. The prokinetic effect of Levosulpiride is mediated through the blockade of enteric (neuronal and muscular) inhibitory dopamine D2 receptors. Results also show that levosulpiride also acts as a moderate agonist at the 5-HT receptor.